A kill-pen broodmare and her wry-nosed filly, once destined to die in a foreign slaughterhouse, are now a powerful force for good as they help those who suffer from post-traumatic stress disorder, brain injury and mental illnesses. Mabeline (JC: Murphy’s Code), who was heavily pregnant with her new filly Lady Liberty last February when she was plucked from the concrete holding facility at the New Holland Auction, now serves to comfort and steady those visiting veterans who arrive at the New Freedom Farm in Buchanan, Va. The pair of Thoroughbreds, saved in a massive effort to rescue a pregnant broodmare band from the New Holland Auction, now spends any given day nuzzling veterans, giving new strength to people still fighting their own internal wars. Foal date: Jan. 28, 2001“The reason I wanted to pair horses with veterans, or anybody suffering with post-traumatic stress disorder, brain injury, anxiety, depression, or substance abuse is because in order to heal, a person first needs to feel present. 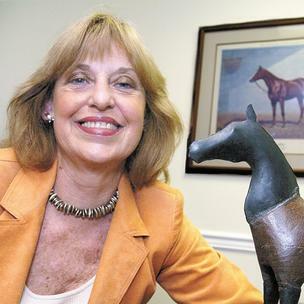 And in order to be around horses, (and stay safe) you have to be very present at all times,” says Lois Dawn Fritz, a Navy veteran and forensic nurse examiner. Fritz and her husband Mitchell, whom she nicknamed Mr. Budget, recently named their new farm New Freedom in honor of the rescued Thoroughbreds, and opened their doors to those seeking to transport themselves from their cares and worries to a place of peace. Mabeline was rescued along with a band of pregnant broodmares in a large-scale effort led by Vermont charity Gerda’s Animal Aid. At the time, the Fritz’s had little interest in taking on the expense and responsibility of a broodmare and foal. But when it appeared the mare had nowhere else to go, they stepped up to face the surprising challenges that soon followed. Weeks after Mabeline arrived, Fritz’s husband prepared for what turned out to be a hard birth by attending a seminar at a nearby breeding farm. The breeder offered her husband a free seat in the expensive class after learning how the couple had helped the mare in need. 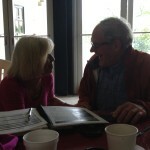 And the knowledge gained saved the day when Mabeline started to give birth on March 31, Lois Fritz says. 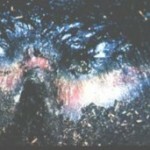 “When Mabeline started to deliver Liberty, only one foot came out, and not much else was happening. I ran to the house to get my husband, and he came back with an instructional booklet he received in the course,” she says. “He stood outside the stall while I was inside, and read it to me.” As professional help was en route, Lois Fritz pulled down Liberty’s other leg, and helped her rush feet first into her new life. But the initial challenges were only beginning. After it became clear that the filly’s face was a little different, and sported a slightly crooked, or “wry nose,” Lady Liberty’s health took a turn. “She almost seemed to have a case of failure to thrive,” she says, noting that after the filly was transported to veterinarians at Virginia Tech she was treated for pneumonia and impaction. Since her arrival, Lady Liberty has had her ups and downs with her health. But she grows stronger. And, she has become an integral part of the Fritz family’s burgeoning nonprofit charity, which opens its doors to Veterans Administration patients, and anyone wishing to come meet the horses. “On Friday I had a group of veterans out to the farm from our local VA hospital, and I noticed in particular that they were looking at Liberty and her deformity,” she says. And then they saw past it, to the survivor who offers her muzzle and soft comfort to those hardened and hurt by life. BH Opening Statement (x Nordic Britanna by Thee Desperado), was featured on the cover of Modern Arabian Horse magazine, published by Arabian Horse Association! With Opening Statement stands Jacklyn Abernathy who was awarded AHA Youth of the Year. Jacklyn is the daughter of Jeanne Brooks Abernathy of Brookhill Farm. We are always so excited to see how the legacy of Mishaal lives on through his babies. Congratulations on your award, Jacklyn Abernathy! In early May 2015, I received an email from Cindy Sturgill, a student attending the University of Louisville Equine Industry Program. She had been on an equine field trip the previous weekend with a graduate student of the Equine Program who had worked at Smith-Embry Insurance Associates while attending U of L. Cindy shared with me that she got into the Equine Program due to her love of horses and her desire to be involved in media in the horse industry. 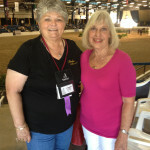 During our conversation we came around to talking about the Arabian Horse and I found out her father had been in the Arabian Horse business more than 35 years ago and she remembered attending many horse shows as a young girl. I told her about the upcoming Egyptian Event and gave her the dates. 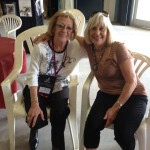 I invited her to join me if her schedule permitted and suggested coming on Thursday for the barn parties where she could get up close to some of the most beautiful horses in the world. I didn’t hear from Cindy until that day when she texted me that she was on her way to Lexington. 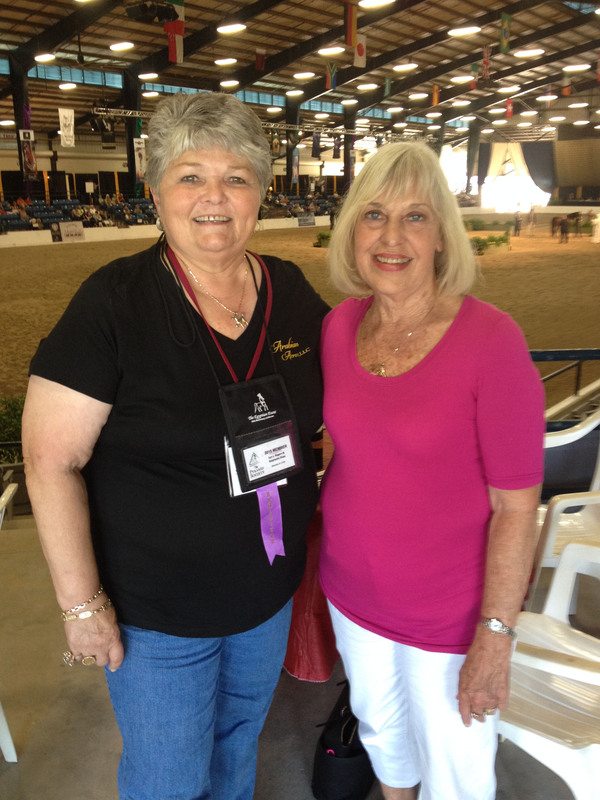 I had not met Cindy in person, but when we found each other that afternoon, she was visibly shaken by the experience of seeing the beautiful Egyptian Arabians entering the ring for the class and watching them show brought tears to her eyes and many wonderful memories. 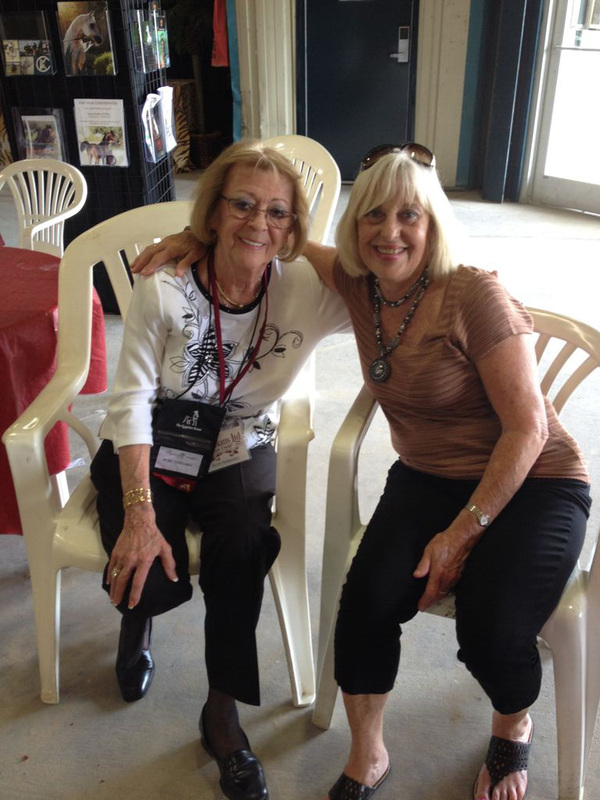 During the day and the barn parties, I was able to introduce her to Anna Bishop, as well as many of my friends and clients. Cindy was able to nuzzle up to some wonderful horses and take numerous photographs. When she got ready to leave, her only disappointment was that she already had plans for Saturday and couldn’t make it back to Lexington for the Finals. Well, she worked through those plans and came back for the Finals on Saturday evening. Her heartfelt thank you for my impromptu invitation and her “Reflection” on the experience is being shared with you in her article which will appear in the near future in the University of Louisville newsletter “Hoofprints”. We just never know how people will enter our lives nor how sharing an experience with Egyptian Arabian Horses can make an impact or stir up a love they have never let go. I hope you enjoy her article. Cindy is a Junior in the Equine Industry Program at the University of Louisville. 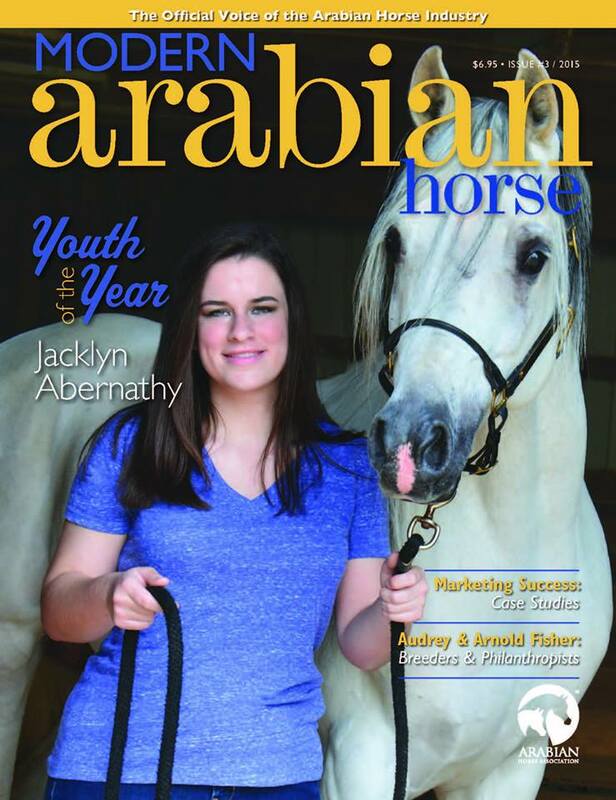 As Editor-in-Chief of their newsletter, “Hoofprints,” she is hoping to enlighten students and their readers on the beauty, majesty, and versatility of the Arabian breed, as well as many of the other breeds with which the Equine Industry is privileged to love and admire. Vesicular stomatitis is a viral disease that primarily affects cattle, horses, swine and occasionally sheep and goats. Humans can also become infected with vesicular stomatitis when handling affected animals. Vesicular stomatitis is most likely to occur during warm months in the Southwest, particularly along riverways and in valleys. The Southwestern United States experienced a vesicular stomatitis outbreak from May 1998 through January 1999. It is essential that veterinarians and livestock owners be on the alert for animals displaying clinical signs characteristic of the disease. In affected livestock, vesicular stomatitis causes blisterlike lesions to form in the mouth and on the dental pad, tongue, lips, nostrils, hooves, and teats. These blisters swell and break, leaving raw tissue that is so painful that infected animals generally refuse to eat or drink and show signs of lameness. Severe weight loss usually follows, and in dairy cows, a severe drop in milk production commonly occurs. Affected dairy cattle can appear to be normal and will continue to eat about half of their feed intake. Vesicular stomatitis has been confirmed only in North and South America. It is known to be an endemic disease in the warmer regions of the Western Hemisphere, but outbreaks of the disease occasionally occur in temperate geographic areas. How vesicular stomatitis spreads is not fully known; insect vectors, mechanical transmission, and movement of animals are probably responsible. One type of vesicular stomatitis virus is known to be spread by phlebotomine sandflies. Once introduced into a herd, the disease apparently moves from animal to animal by contact or exposure to saliva or fluid from ruptured lesions. 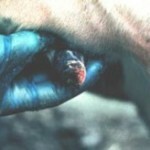 Humans can contract vesicular stomatitis when handling affected animals if proper biosecurity methods are not followed. Prevalence of this disease in humans may be underreported because it may often go undetected or be misdiagnosed. In people, vesicular stomatitis causes an acute influenza-like illness with symptoms such as fever, muscle aches, headache, and malaise. Why is it so important to promptly recognize animals with vesicular stomatitis? We live in an area where this disease has often been seen in past years, and in fact Fort Collins was the epicenter of the last U.S. outbreak in 1998. Thus, we have an increased risk of seeing cases in Colorado this year as cases have recently been confirmed in horse premises in Texas and New Mexico. Vesicular stomatitis is recognized internationally as a reportable disease, which means that there are serious economic and regulatory repercussions associated with the diagnosis, and several countries have already taken action to block movement of U.S. horses as a result of the TX and NM cases. If a VS case were diagnosed at the VTH and it appeared that transmission might have occurred within the VTH then we could be quarantined for several months. In 1998, the average duration of quarantine of affected premises was 120 days, and it was generally longer at large operations! Be on the look out for recent horse events. While vesicular stomatitis can cause economic losses to livestock producers, it is a particularly significant disease because its outward signs are similar to (although generally less severe than) those of foot-and-mouth disease, a foreign animal disease of cloven-hoofed animals that was eradicated from the United States in 1929. The clinical signs of vesicular stomatitis are also similar to those of swine vesicular disease, another foreign animal disease. The only way to tell these diseases apart is through laboratory tests. Horse owners can also receive other treatments. What are clinical signs of vesicular stomatitis? In affected livestock, the incubation period for vesicular stomatitis ranges from 2 to 8 days. Often, excessive salivation is the first sign. Body temperature may rise immediately before or at the same time lesions first appear. Initially, close examination of the mouth reveals blanched and raised vesicles. If there are no complications such as secondary infections, then affected animals recover in about 2 weeks. Vesicular stomatitis does not generally cause animals to die. • Horses: upper surface of the tongue, surface of the lips and around nostrils, corners of the mouth and the gums. 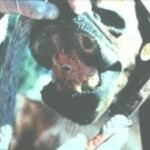 • Lesions involving feet of horses and cattle are not exceptional. 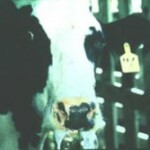 • Teat lesions occur in dairy herds. 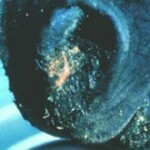 • Foot lesions and lameness are frequent in pigs. • Recovery in around 2 weeks. • Complication: loss of production and mastitis in dairy herds due to secondary infections, lameness in horses. Erosions and exudate in the nares. Cow drooling because of mouth lesions. Erosions – ruptured vesicles – of the gingiva. Erosions on a teat. Erosions and dried exudate on the coronary band and heal. Hyperemia and beginning erosions on the coronary bands. Erosions – ruptured vesicles – on the tongue. Vesicles on the tongue. Cow drooling because of mouth lesions. Erosions – ruptured vesicles – of the gingiva. Erosions and exudate in the nares. Erosions – ruptured vesicles – on the tongue. Erosions and dried exudate on the coronary band and heal. What can we do to protect our animals? There is no specific treatment or cure for vesicular stomatitis. Owners can protect their animals from this disease by avoiding congregation of animals in the vicinity where vesicular stomatitis has occurred. Mild antiseptic mouthwashes may bring comfort and more rapid recovery to an affected animal. Good sanitation and quarantine practices on affected farms usually contain the infection until it dies out of its own accord. In order to protect our hospital and our patients, we will include appropriate questions related to vesicular stomatitis when taking all patient histories, and we will purposefully look for characteristic lesions when performing admission examinations for all susceptible patients. We will also ask the owners of susceptible animals to have their animal examined by a referring veterinarian for the presence of characteristic lesions within 48 hours before arriving at the hospital. • Immediately contact your local veterinarian or State or Federal animal health authorities. • Separate animals with lesions from healthy animals, preferably by stabling. Animals on pastures apparently are affected more frequently with this disease. • As a precautionary measure, do not move animals from premises affected by vesicular stomatitis—unless they are going directly to slaughter—for at least 30 days after the last lesion found has healed. • Implement on-farm insect control programs that include the elimination or reduction of insect breeding areas and the use of insecticide sprays or insecticide treated eartags on animals. • Use protective measures when handling affected animals to avoid human exposure to this disease. Beverly Smith-Embry thinks most insurance jobs sound boring. 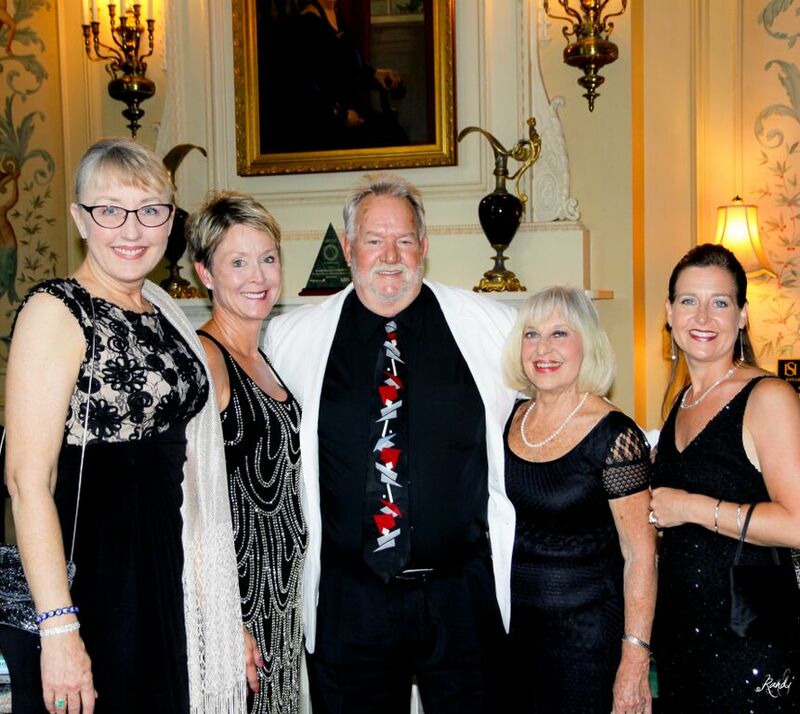 But by starting an insurance agency in an unusual niche, she found a way to enjoy her work. 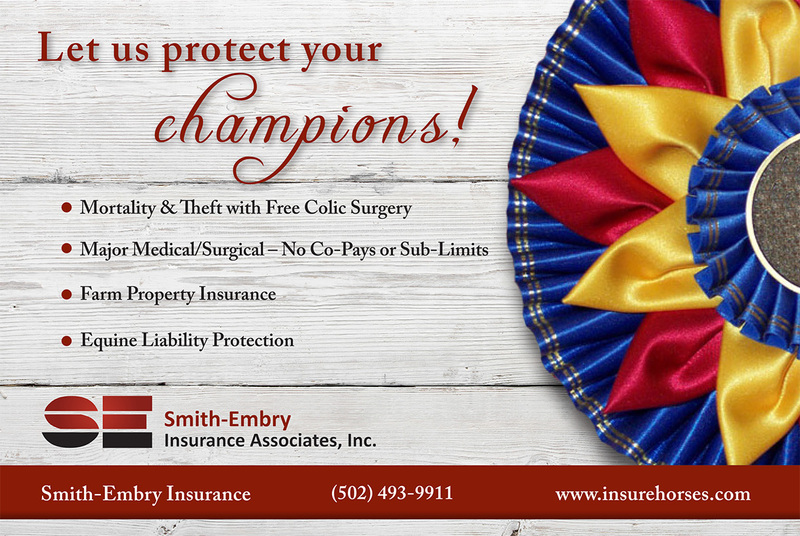 Beverly A. Smith-Embry, president of Smith-Embry Insurance Associates Inc.
Smith-Embry Insurance Associates Inc., was founded in 1991. Besides Smith-Embry, the agency has two other employees: Chuck Smith, her son, and Tamara Embry, her sister-in-law. Smith-Embry said she never expected to work in the equine insurance industry until she found a job as an assistant for Edward McGrath, the former owner of E.J. McGrath Insurance Co. He wrote equine insurance policies for Lloyd’s of London and other insurers of Thoroughbred racehorses. She joined McGrath’s firm in 1978 and left the agency not long after McGrath sold it in 1991. 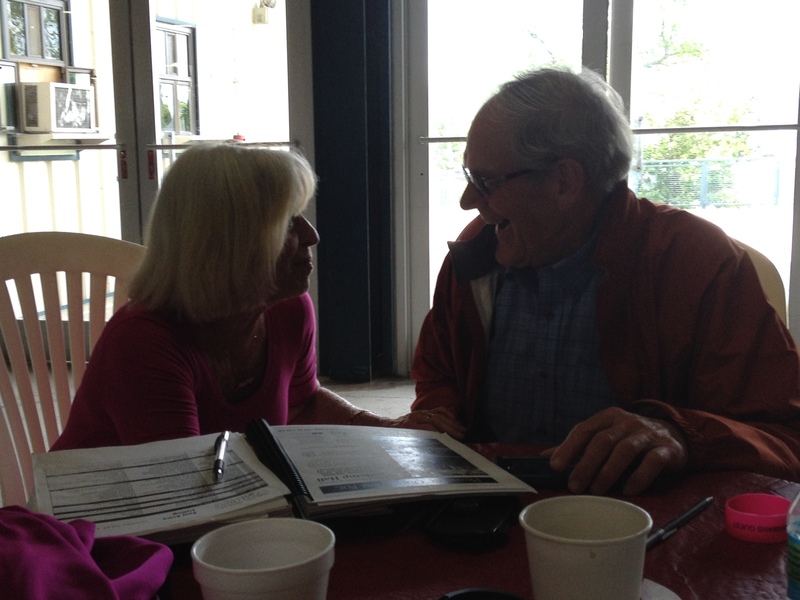 She had helped sell insurance to owners of many well-known Thoroughbreds, including Kentucky Derby winners Affirmed and Genuine Risk. 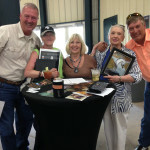 That experience gave her connections to the equine industry and the motivation she needed to form her own agency later in 1991, she said. “Once it is in your blood, it is kind of hard to leave because it is kind of an exciting career. 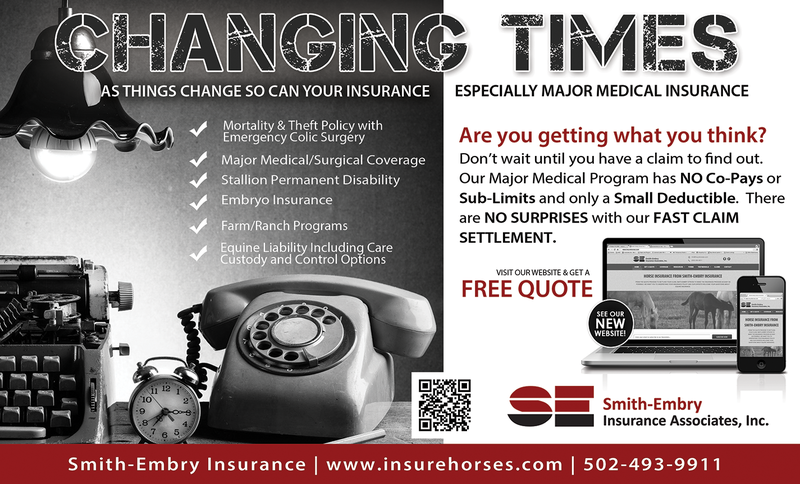 It is insurance, but kind of with a little twist,” Smith-Embry said. A big difference in her job and typical insurance sales is that it’s difficult to determine the insurable value of horses. That is because that value is based not only on the price the owner paid for the horse and its breed but also criteria such as its potential earnings and its value to the individual client’s business. 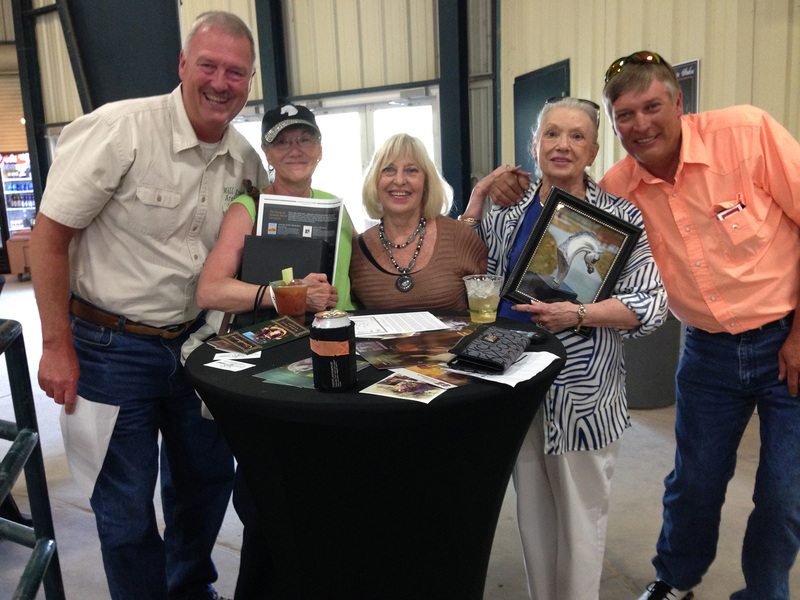 Are most of your clients Thoroughbred owners? “No. It is very, very competitive. … The competition in the Thoroughbred industry makes it really difficult to get into. So, I decided you have to go where the business takes you. There are a lot of other breeds, and we focus mostly on those. A lot of my clients have breeding farms” for show horses and breeds such as Arabians and Saddlebreds. “No. My husband and I were in one of those little racing partnerships for a while. He loves that end of it, and I, sitting in my chair, see that you hear about the people who make money … but you don’t hear about all the money you have to put in to make money. 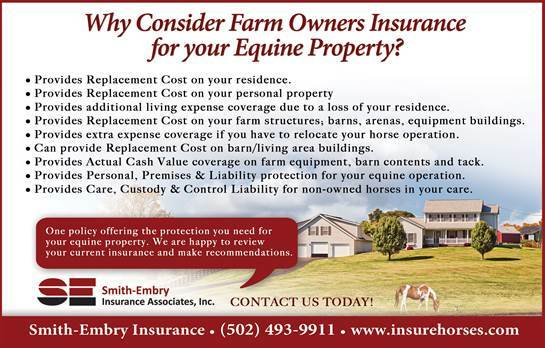 Why should you consider a Farm Owners Insurance Policy for your Equine Property? A Farm & Ranch Owners Policy will provide replacement cost insurance on your residence. A Farm & Ranch Owners Policy will provide replacement cost insurance on your household personal property. A Farm & Ranch Owners Policy will provide replacement cost insurance on your barns, farm structures and other outbuildings on your premises. A Farm & Ranch Owners Policy will provide Additional Living Expense during reconstruction of your residence from an insured loss. A Farm & Ranch Owners Policy can include Extra Expense coverage for loss of use of your barn requiring you to board your horses or continue your equine operation at another facility during reconstruction of your stable from an insured loss. A Farm & Ranch Owners Policy can provide insurance on your farm equipment. 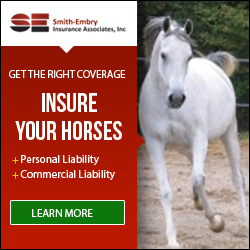 A Farm & Ranch Owners Policy can provide insurance on your tack and horse equipment. A Farm & Ranch Owners Policy will provide not only your personal and premises liability, but will include equine liability for bodily injury or property damage cause by your horses both on and off of your premises. A Farm & Ranch Owners Policy can provide insurance for the commercial liability exposures if you operate your horse ownership as a business or offer boarding of non-owned horses, provide riding lessons, horse breeding or horse sales. A Farm & Ranch Owners Policy can provide Care, Custody & Control Liability offering protection for you should legal action be taken against you for the death or injury to a non-owned horse in your care.